I love shopping for items for my home. 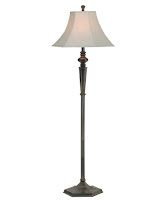 A while ago I purchased an item from from 1800Lighting and I have so say that I love it. Before I tell you about it, let me tell you more about the company. The typical Capitol Lighting store spans 12,000 square feet, which allow room for a huge selection. While many lighting showrooms boast a wide selection, Capitol Lighting delivers both a great selection, and affordable lighting. That ability to see so many products firsthand is a distinct benefit when it comes to outfitting a new-construction home with a complete set of fixtures. After determining the desired style, reviewing an architect's plans and visiting the home site (if requested), one of Capitol's highly trained and experienced sales and design consultants can walk a customer through one of our lighting stores and point out fixtures that will meet the project's needs, from our selection of affordable lighting. Home lighting products have made great strides in recent years in terms of performance and styling. Walk into Capitol Lighting and you're likely to be stunned by the variety of available designs, light sources, sizes and coordinating accessories on hand. Now that you have learned a little more about them, let me tell you more about what I bought! I spent forever on the 1800Lighting website and after looking, I finally found something I needed. Yes, I wanted everything I seen because they have so much to choose from. I ended up buying this Kenroy Home 31511 Georgetown 58 Inch Floor Lamp for my bedroom. I have to say that I am completely in love with it. I love the gold bronze! It gives my room that elegant look without having to break the bank. So far so good with it. It is in the corner of the room. The Linen Hex Bell Shade gives it that look I love as well. Overall, I love it and I would buy another again if I had the chance. You should check them out and see what you like! Afterall, 1800Lighting has something for everyone! Follow them on Facebook, Twitter, and Youtube. Want to make your dream Pinterest board? They are on there too! Follow them! One last thing, they have a blog, you might want to check that out as well. That's a really pretty lamp! You are right, they have so much that I would absolutely love to have!